Bimalleolar fracture non unions are not uncommon as once thought. To treat such conditions a good prep planning is required and results can be good. However it is important that we counsel the patients on the possibility of secondary arthritis of the ankle in the future and the need for secondary arthrodesis must be informed. Case Report | Volume 5 | Issue 4 | JOCR Oct-Dec 2015 | Page 82-84| Navin Balasubramanian, Ganesh Babu, Sindhuja Prakasam. DOI: 10.13107/jocr.2250-0685.355 . Department of Orhopaedics, Saveetha Medical College, Chennai. / 2Department of Orthopaedics, Sri Ramachandra Medical College, Chennai. India. / 3Department of Orthopaedics, Government Peripheral Hospital, Chennai. India..
No 19, 21st Main Road,Anna Nagar, Chennai 600040. India. 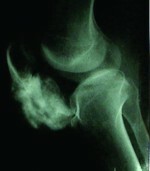 Introduction: Established non-unions pose a real nightmare for even the most accomplished surgeon.The variations in anatomy due to extensive fibrous tissue growth, soft tissue contractures around the fracture site and bony alterations like smoothening and sclerosis of the fracture ends must each be addressed as a whole if good outcome is to be expected. Case series: Here we present a series of 11 patients who had bimalleolar fracture of the ankle following which they had native splinting. These patients presented to us with established non-union. There were 7 males and 4 females in the study. The average age was 44.63 years. Ten out of the 11 patients went on to union (90.1%) following internal fixation with or without immobilization in a plaster cast at an average of 13.8 weeks (range 12- 17 weeks). The remaining patient did not progress to union and was advised revision fixation but she refused. She was put on an ankle foot orthoses and mobilized with satisfactory results. There was no infection in any of the patients. Two patients had delayed wound healing with delayed suture removal at 18 days. Weight bearing was started at the end of 16 weeks in all the patients. All patients were assessed using the Karlsson and Peterson functional score for the ankle. Six patients had excellent outcome, 3 had good outcome, 2 had fair with one patient having poor functional result. Conclusion: We conclude that open reduction internal fixation +/- bone grafting provides excellent union rates and good functional results in even the most established non unions of bimalleolar fractures of the ankle. The treatment of ankle fractures has been from early years a subject of continuing debate and controversy regarding the indications for conservative versus surgical treatment. The whole situation changes for the worst when soft tissues and bony anatomy is altered due to the practice of massaging which forms the core of the native bone splinting. The emergence of spurious native bone setters in the Indian subcontinent has only increased the incidence of such fractures being treated by them . The increased incidence of such spurious practices is due to ignorance among general public and false promises of non operative successful treatment of all fractures alike offered by the bone setters. The result is that most of the patients treated by the native bone setters end up with a non-union and also have soft tissue complications. As a result the number of orthopaedic surgeons encountering such patients has become more common. The study was conducted between September 2010 to August 2013. Eleven patients who presented to us with non-union of bimalleolar fractures were included. There were 7 males and 4 females. The average age was 48.63 years (31-56 years). The average time of presentation since injury was 18.45 weeks (range 14-22 weeks). All patients were subjected to internal fixation with plate and screws for the fibula. 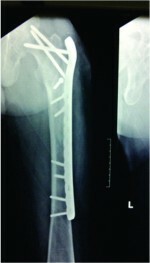 Nine patients had screw fixation for the medial malleoli and two patients had tension band wiring (TBW). Additional bone grafting harvested from the distal femur was used in 3 cases to augment fixation. Six patients were immobilized with a below knee plaster cast for 12 weeks. All patients were started on non –weight bearing walking with walker support from post-operative day ‘1’. Wound dressings, antibiotic prophylaxis and suture removals were done as per standard protocols in all but two patients. All patients were followed up at 4, 8, 10, 12 weeks and weekly thereafter till radiological evidence of union[Fig 2 & Fig 3] was made. The functional assessment was tabulated using the Karlsson and Petersson scoring system. All 11 patients were followed up till the end of the study. Ten of the 11 patients went on to union at an average of 13.8 weeks (range 12-17 weeks). Patient No. 5 (Table1)had a comminuted fracture of the medial malleoli which was treated by tension band wiring which failed to unite with bone resorption seen on follow-up radiographs. She was a diabetic with a BMI of 31. She was offered a revision fixation with bone grafting but she refused for surgery. She was put on a Ankle-Foot Orthoses (AFO) and mobilized. Although she had satisfactory mobility with a walker support her functional outcome was poor. Four patients had a painful scar which improved at the end of 4 weeks. The two patients who had delayed wound healing and delayed suture removal were both females with BMI > 30 with diabetes. The functional ankle score was excellent in 6 [Fig 4 & Fig 5], good in 3, fair in one and poor in one. The incidence of fibular non-unions in isolated fibular fractures is well documented . The most common cause being interposition of soft tissue namely the Posterior tibial tendon (PTT). Hence, careful dissection and removal of the interposing PTT tendon is important for both fracture healing and good PTT function. Bhavik et al  attributed the cause of medial malleolar non-unions as due to the interposition of deltoid ligament. 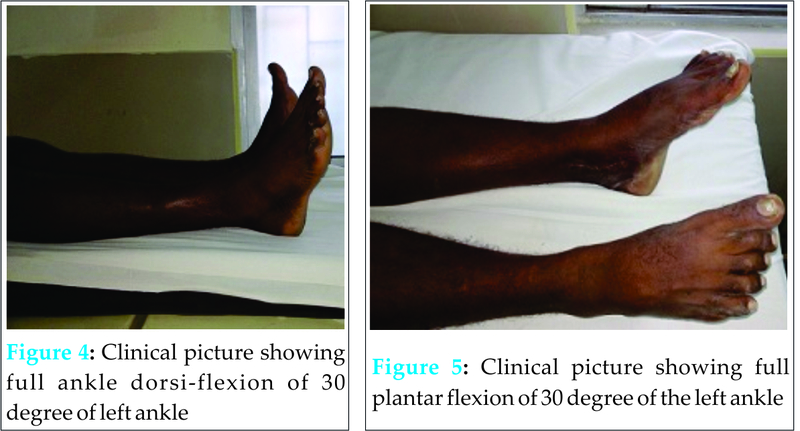 They also emphasized that when fixation of bimalleolar fractures is undertaken, the lateral malleoli is to be addressed first as the length of the leg and subsequent stability of ankle mortise is attributed to a anatomical fibula. In our study also in all of the 11 patients the lateral malleoli was fixed first followed by the medial malleoli. Frank et al  showed that the incidence of non-unions was higher in the conservative group and the incidence was low in the group treated by open reduction and internal fixation. They also concluded that anatomical reduction of both the malleoli with equal joint space both medially and laterally was paramount in obtaining a good to excellent outcome. Clements et al  concluded that radiological medial and lateral joint space <4 mm is indicative of excellent functional outcome. They concluded that functional scores were substantially lower in those with either joint space >4 mm. This indicates that the ankle joint is not concentrically reduced but eccentrically placed if either the medial or lateral joint space is > 4 mm. Charnley et al  showed that fractures of the bimalleolar region almost always requires open reduction and internal fixation for all displaced fractures. The incidence of complications like non-union occur more frequently in conservative treatment group. Ankle fractures have a bimodal age distribution. Their incidence in younger population is attributed to the high occurrence of high velocity injuries. The incidence in elderly population is due to osteoporosis and age related dementia and neurological disorders. Conservative treatment can be undertaken in selected fresh fractures, but in established non unions operative internal fixation +/- bone grafting is the only treatment which can offer good results. In our study, we have concluded that with good soft tissue dissection, freshening of the fracture ends with good reduction and internal fixation with appropriate implants ensures good results in our majority of the patients. The results of operative fixation of established non-unions of bimalleolar fractures is still a challenge to many orthopaedic surgeons. With careful re-op planning and strict adherence to AO principles these fractures can be treated successfully with good results and ankle functions can be preserved. 1. Mendelson Howard A : 13 non –unions of balleolar fractures of the ankle. Clin Orthop & Rel Res. 1965,Vol 42.Issue 13. 2. Curry EE, O’Brien TS, Johnson JE. Fibular non union and equino varus deformity secondary to posterior tibial tendon incarceration in the syndesmosis: A case report after a bimalleolar fracture.Foot & Ankle International: August 1999; 20(8): 527-531. 3. Dalal BY, Chaudhri KJ, Patel PJ, Bhesaniya RR. A study of Bimalleolar fractures treated with open & closed method by TBW, k-wire, CC screw & semitubular plate International Journal of Scientific Research October 2014;3(10). 4. Wilson JR FC, Skilbred LA. Long term results in the treatment of displaced bimalleolar fractures. J Bone Joint Surg Am 1966 Sep;48(6): 1065-1078. 5. Clements JR. Motley TA, Garrett A, Carpenter BB. Non operative treatment of bimalleolar equivalent ankle fractures : A retrospective review of 51 patients. Journal of Foot & Ankle Surg January-Febuary 2008; 47(1):40-45. 6. Lauge- Hansen N. Fractures of the ankle.II. Combined experimental-surgical and experimental roentgenologic investigation. Arch Surg 1950;60:957-985. 7. Burwell HN , Charnley. The treatment of displaced fractures at the ankle by rigid internal fixation and early joint movement. J. Bone Joint Surg.1965; 47 B:634-660. 8. Johnson E E, Davlin L B. Open ankle fractures- Indications for immediate open reduction and internal fixation. Clin Orthop 1993; 292:118-127. 9. Joy G, Patzakis M J, Harvey J P. Precise evaluation of the reduction of severe ankle fractures. J Bone Joint Surg. 1974;56A: 979-993. 10. 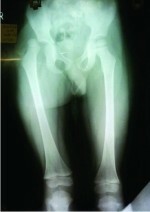 Mak K H, Chan K M, Leung P C. Anklr fracture treated with AO principle – An experience with 116 cases. Injury 1985;16:265-272. 11. Makwana N K. Conservative versus operative treatment of displaced ankle fractures in patients over 5 years of age. A prospective randomized study. J. Bone Joint Surg. Br. 2001;12:525-529. 12. Bostman O, Hirvensalo E, Vainiopaa S et al. 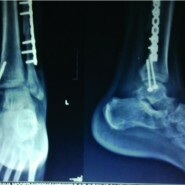 Ankle fractures treated using biodegradable internal fixation. Clin Orthop 1989; 238:195-203. 13. Bray T J, Endicott M, Capra S E. Treatment of Open ankle fractures. Clin Orthop 1989 240:47-52. 14. DeSouza L J, Gustilo R B, Meyer T J: Results of Operative treatment of displaced external rotation-abduction fractures of the ankle. J Bone Joint Surg 1985; 67A:1066-1074. 15. Hughes J L, Weber H, Willenegger H, Kuner E H. Evaluation of ankle fractures. Clin Orthop. 1979;138:111-119.